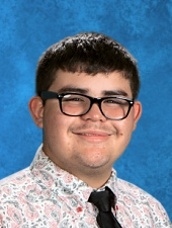 I would like to nominate Jose as "Student of the Month" for April, 2018. Jose has proven to me for the past 4 semesters that he possesses a strong willingness to work diligently at any task set before him. Jose has spent many hours in the Programming, Machining, and Assembly departments at the JR Butler manufacturing facility, and has also developed many of the skills necessary to be a significant value add to each department. Jose is prompt and professional, and maintains a pleasant demeanor during the entirety of his internship shift. His willingness to participate in all activities, ranging from meetings to stretch and flex and 5S (cleanup) is admirable. He has a good eye for detail as well as a strong drive for production. He is truly a student of our process, and has an aptitude for success in any endeavor he sets out to pursue. In short, Jose is a pleasure to work with. He is reliable and pleasant, which constitutes my 2 most highly valued traits in an individual. I am excited for him to graduate next month, and I am pleased to bear witness to his continuing efforts toward excellence in everything he does.